Lady and the Blog → Personal Blog → Daily Diary: Anyone Else Happy The Shopping Madness Is Over? Daily Diary: Anyone Else Happy The Shopping Madness Is Over? This whole weekend knocked the you-know-what out of me. I mean – seriously. As a blogger, I felt it was MY DUTY to constantly update my posts with sales and websites. I think I had a migraine for 4 days straight. It’s just all too much. And then there’s that feeling that you HAVE to take part in it. I only went to Toys R Us on Black Friday – and that was enough for me. But even when I got home, I kept thinking …. maybe I should go to Lord and Taylor, and Macy’s… and X. WHY? I don’t NEED anything. But apparently, I need it on sale. I kept having to SHAKE off the feeling to participate. Did you get that feeling? Today is veg-tastic. Now that Cyber Monday is behind me, I’m just going to go back to my normal routine. 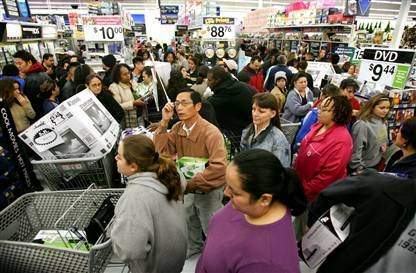 Oh my goodness…so glad Black Friday is only once a year. My husband was so sweet and wanted to go with me this year, and boy did he get a rude awakening…poor guy. LOL But he stuck it out and we got a lot of great deals!! Over $1,000 worth of stuff for $350 😀 My man was impressed 😀 And on CyberMonday, I got two blouses from Ann Taylor Loft (both Christmas gifts) for $17 after taxes and free shipping!